SRO GALLERY is pleased to present an exhibition of paintings by Robert Egert: Anthropocene. Opening Reception April 28, 6-9pm. The exhibit will be on view through May 20, 2018. Anthropocene: the period of time during which human activities have had an environmental impact on the Earth regarded as constituting a distinct geological age. 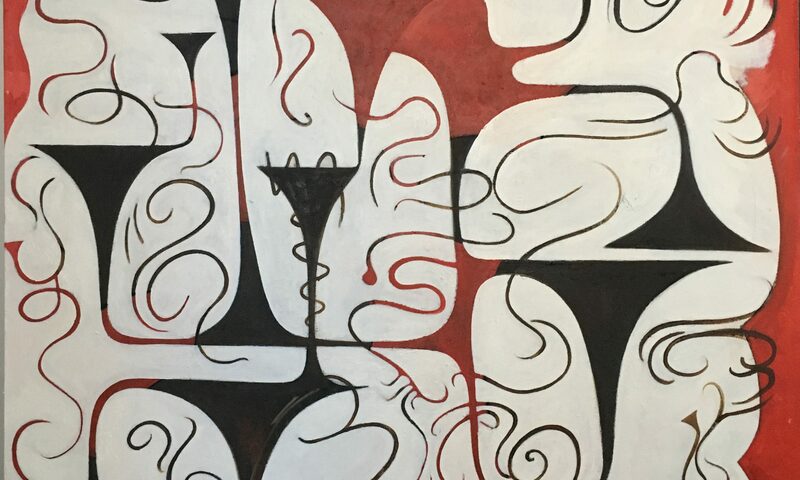 In his most recent paintings shown here at SRO GALLERY, Egert’s mathematical surfaces and classically inspired vessels morph into worlds of their own. While they suggest classical influences, these paintings move the viewer towards contemplations of the future. The forms in his paintings place the viewer in a position where it is possible to stand before the scene of natural landscape, architecture, (in one painting a collection of vessels that seem to carry the source of life), or dive back into the distance of these scenes, in an attempt to gather more information and question where in his invented world we prefer to stand. In some we look through passages to find familiar mechanics. Pipes form an imagined sort of plumbing – conduits of our changing natural, industrial and AI environment perhaps. We wonder at the connection between the familiar and the unknown. There is nature, science, architecture and archeology found in all the paintings. The works on paper suggest chemical reactions in nature, forms of the human body are felt, as if we are all subject to spontaneous happenings. We feel the interior and the exterior simultaneously. Robert Egert was born in Brooklyn, NY in 1958 and studied painting at Pratt Institute with Autonomia founder Ernst Benkert and sculptor Ursula von Rydingsvard. He later obtained a graduate degree from City University Graduate Center with a focus on critical theory. 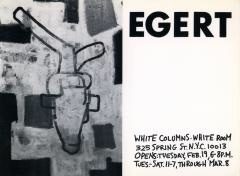 Egert began exhibiting his painting in New York in the 1980s with his first solo exhibition at White Columns gallery. 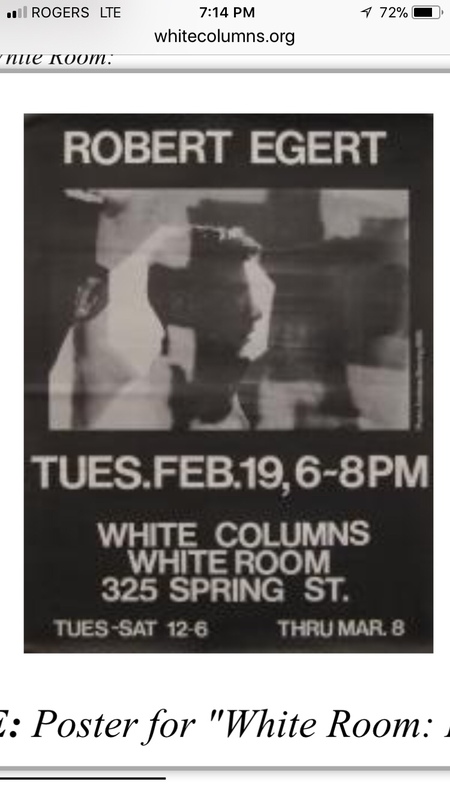 Shortly thereafter he joined Civilian Warfare, one of the galleries that launched the emerging East Village art scene. His solo show there of large scale oil paintings led to participation in numerous exhibitions at both emerging and established venues that included Gracie Mansion, Jack Tilton, and Holly Solomon. 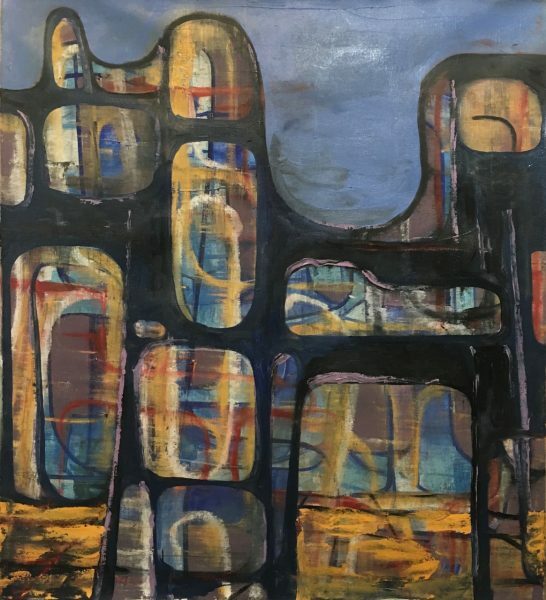 Most recently, his work has been featured in solo exhibitions at Fred Valentine Gallery, Ethan Pettit Contemporary Art, Holland Tunnel, and Rockland Center for the Arts, all in New York. Robert Egert currently works and resides in the New York metropolitan area. 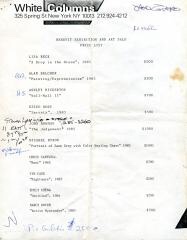 His paintings and works on paper are held in private and institutional collections in New York, Los Angeles, Chicago, Indianapolis and Dusseldorf. Robert Egert’s immediately previous paintings were small, curvy and marvelously dense, like ideograms tooled in leather over a long Siberian winter by hunter-gatherers whose sacred geometry was sprung from tusk and antler. His work now emerges into the open, under a big sky. Here abstract painting grapples, as if it were sculpture, with literal landscape. 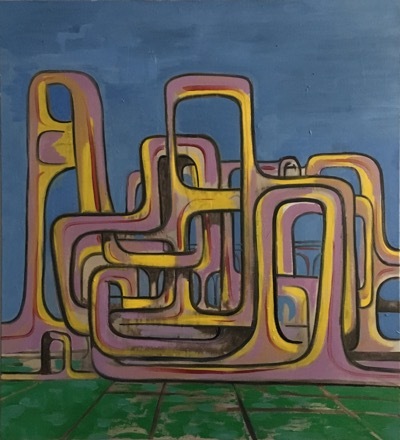 Several of the new paintings recede into prairie space and cloudscape, while bodying forth into a reimagined version of Henry Moore, Barbara Hepworth and Isamu Noguchi that can co-exist with breezy 1950s New Yorkercartoons of construction workers eating sandwiches in the belly holes of reclining nudes. A couple of paintings seem to suggest how Paul Klee’sRevolution of the Viaductcould work as a background for an animated Hawaiian Punch ad. At the far horizon of Egert’s new territory, George Grosz –– or rather his bedraggled avatar, the Painter of the Hole –– has set up his easel. In the middle distance you can make out Max Ernst, Otto Dix, RenéMagritte and Giorgio De Chirico, fellow survivors of war and avant-gardism, stubborn purveyors of figures and landscapes in the age of abstraction. And what was it we once meant by abstraction? Like Columbus discovering America, Cezanne voyaged across an ocean and made landfall, believing he was elsewhere. Richard Shiff points out that “abstracted” means lost in thought, yet when speaking about art, the word has come to signify pure materialism –– a materialism in which nothing can be added or taken away, nothing extracted, nothing abstracted. What you see is what you see. Instead, Shiff uses the word “distraction” to describe how Cezanne’s slipping space and overt brush strokes, rhythmically independent of the subject, liberated later generations to see the materials of painting as means and ends in themselves. If Tornado Alley and Cisgenia are airborne, Spirit (or Soul) is semi-subterranean. Egert says this painting is at the core of his practice, and indeed it reads like a cutaway view of compressed potential and hidden caverns. Although landscape elements are breaking free at the top, the rest is a cultivated puzzle of interlocking shapes embedded in their own negative space. In other paintings on view, similar cubist conundrums are isolated, and liberated. They become actors in a drama. Death’s Head Tree, especially, is a self-entangled, concretely rendered monologue that lilts with animation. It is rooted in solid ground and stands clean against the sky. In Monster Storm,a finely honed sculptural scrim is set against a middleground of interweaving plumbing rendered with scratchy urgency. The palette is subtle and sooty. Standardized indications of smoke and steam in the background suggest 1930s animation, factory pipes tooting along with Mickey or Popeye as they bounce with song. The hairy eyeball sort of cartooning is equally in play –– that of Grosz, R. Crumb, Sue Coe and other graphic rebels. The mood, in any case, is nervous and unresolved rather than jaunty, the space claustrophobic despite its layers of distance. Finally, Anthropocene is a spectacular outlier that tweaks the knobs of abstraction all the way to the post-apocalyptic. A woody corpse against barren ground, it is candidly illusionistic, lit with a sense of cinematic conviction that brings to mind the moralizing sunsets of Thomas Cole and Sanford Gifford, or alternately, a Sci-Fi paperback. Birthed in abstraction, however, the image remains ontologically tangled, closer in spirit to a scholars rock or an uncanny Ernst forest, albeit a denuded one. A hundred years on, pure abstraction today is a kind of sophisticated joke. Practitioners and enablers of shiny plastic abstraction, shamelessly nostalgic abstraction, crapstraction/zombie formalism, and so on –– they are necessary tight rope walkers patrolling the event horizon of a slippery slope. Beyond is a black hole of credulity. That leaves plenty of room for therest of us to build landscapes, figures, and still lives of some kind, of some degree, out of pure painting moves. It’s a wide open territory, and Robert Egert, with astute painterliness, has staked out his own growing claim. The painting that I dreamed.